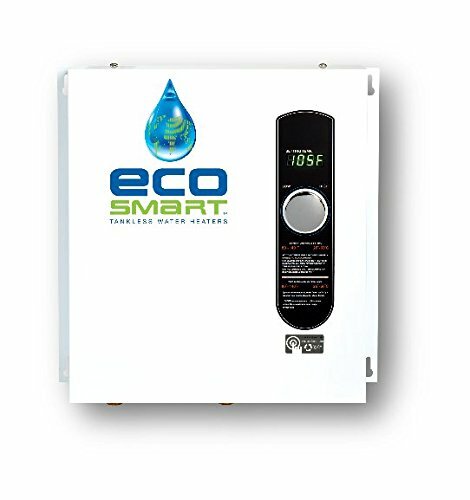 The EcoSmart Eco27 has become a very popular electric tankless water heater. This is largely because of the company's environmental focus and the reasonable and competitive price point of their water heaters. Our review will take a deep, unbiased dive into this sleek, no-nonsense tankless water heater. The EcoSmart 27 is definitely worth a second look, if it's not already on your short list. Precision Control: The ability to increase the outgoing water temperature by 1-degree increments. Self-Modulating Technology: The amount of electricity the unit draws is based on the demand for hot water. Which allows the unit to save energy while still delivering hot water. Digital Temperature Display: The digital disply will show the exact outgoing water temperature as it leaves the water heater. Compact: Because of the units sleek compact design, the EcoSmart Eco27 is capable of fitting into tight spaces. The EcoSmart Eco27 is a very efficient electric tankless water heater. Much of it's efficiency comes from the self-modulating technology. The total wattage of the unit is 27 kW, however, its separated into three individual 9 kW heating chambers. The individual heating chambers allows the tankless unit to use only the amount of energy needed to heat the water. EcoSmart claims that their water heaters can reduce your water heating costs by up to 50% because of this technology. Like all tankless water heaters, the GPM flow rate is determined by the temperature of the incoming water, or more accurately the "temperature rise". EcoSmart is very upfront about the GPM expectations and state in their literature that this unit will deliver 3 GPM when the incoming water temperatures are as low as 37F. With a 3 GPM flow rate you can expect the Eco27 to deliver 2 showers simultaneously in most circumstances. This handy no-nonsense chart by EcoSmart compares the incoming temperature to the GPM expected results for all of their ECO models. The EcoSmart Eco27 has an incredible limited lifetime warranty on exchangers, electronics, and heating elements. However, the unit must be installed by a licensed plumber/electrician within 30 days of purchase. You can find the warranty information HERE. 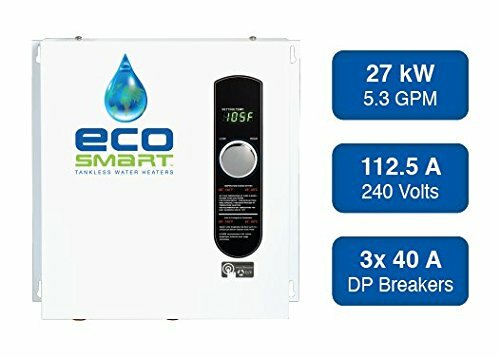 The Eco27 is a very reasonably priced electric tankless water heater. The on-going energy savings, due to the self-modulating technology, initial purchase price, and the lifetime warranty, makes this tankless unit hard to beat. One note to keep in mind, if you're buying this unit to replace a tank-style water heater, be sure your household has adequate electricity. Electric tankless water heaters pull a tremendous amount of electricity, and many homes, particularly older homes, will need to be upgraded. If you need to upgrade your electrical supply you'll undoubtedly add substantially to the initial cost. EcoSmart is a US based company that was founded in 2008. Their mission is "to produce and distribute quality green energy products that are efficient and economical for consumers." EcoSmart may be a young company, but they are gaining in popularity because of their economical prices, customer service and overall quality. The company specializes in water heating products, such as pool and spa heaters and they have a wide and growing range of tankless water heaters to meet every household need. We were curious if their customer service is as good as they claim, so we reached out to EcoSmart. Within a couple of hours we received a response. Each question we asked, was answered in a friendly and efficient manner. Space Saving - uses less space than a tank-style water heater. Saves Money and Energy - Since it only works when you need hot water, the Eco 27 won't draw electricity during stand-by times. Self-Regulates - The Eco 27 is able to adjust the amount of energy required based on the amount of hot water needed. 99.8% Energy Efficiency - This rating means nearly all of the energy drawn to operate the unit is used to heat the water! Energy Savings - You can save up to 50% in energy costs when you switch from a traditional water heater. 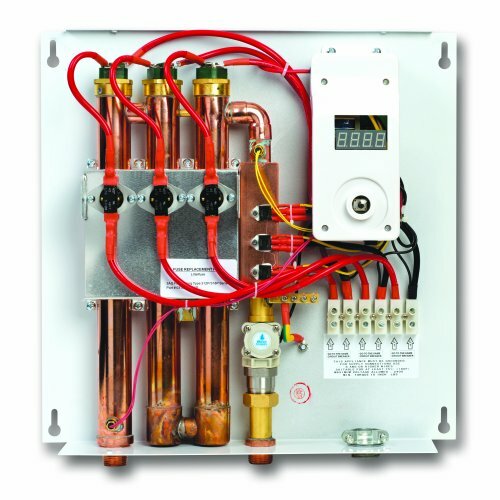 Endless Supply of Hot Water - When your tankless is sized correctly to your home, hot water never stops flowing. Fuel Cost - Since electricity is typically more expensive than natural gas, the Eco 27 will cost more to run than a gas tankless water heater. Although, electric tankless heaters are more environmentally friendly - so it's a bit of a trade off. Instant Hot Water - When you open a hot water tap, the Eco 27 immediately turns on. However, there will be a delay for the hot water to reach the facuet as it travels thru your home's plumbing. This is true with all water heaters, and if having instant hot water is important to you, consider installing a small tankless unit at the source. Sizing is Critical - Purchasing the right size tankless is a must if you want to have an endless supply of hot water. If in doubt, it's better to purchase a larger unit, such as the Eco 36. The EcoSmart Eco 27 tankless water heater is an excellent choice. It's a solid performer and has a good reputation among users. We wish the lifetime warranty had less hoops to jump thru, but if you plan your purchase and installation appropriately, you'll be able to take advantage of one of the best warranties in the industry. 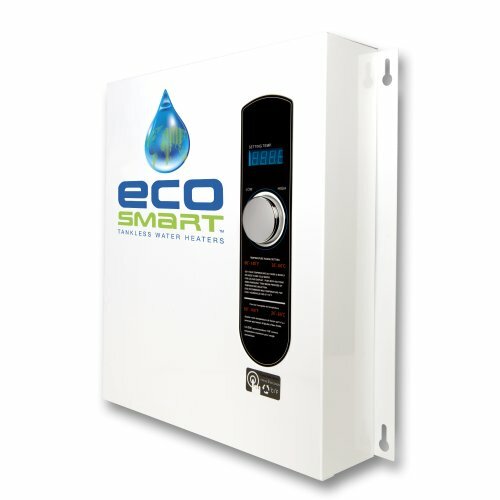 EcoSmart does manufacture an Eco 36 tankless water heater, which is designed identical to the Eco 27. The primary difference is it'll use 36 kilowatts of energy, but it'll also be able to deliver 3.6 GPM when the incoming water temperature is 37 degrees. The additional power means it can handle up to 4 showers and 2 sinks.